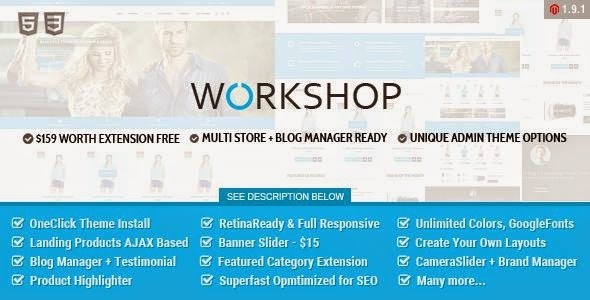 Workshop is a premium responsive & retina ready magento theme for any eCommerce business with clean, modern and elegant design. It was designed with focus on user experience and usability, to make Magento shopping easy & quick. Its easy to customize, fully responsive, comes with lots of required features & display to all devices. Customize your website as much as you want, you have tons of layout possibilities with unlimited variations and colors. Item Reviewed: Workshop Responsive and Retina Ready Magento Theme 9 out of 10 based on 10 ratings. 9 user reviews.